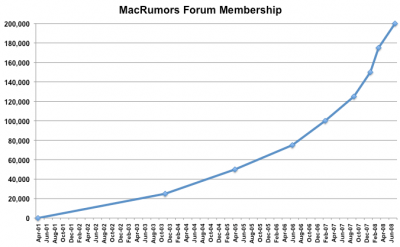 This morning the MacRumors forums crossed the 200,000 member threshold. The rate of new registrations reached a peak of nearly 10,000 per month in January and February 2008, in the wake of the MacBook Air launch at Macworld San Francisco. While the rate decreased in the months following, it has recently spiked again to nearly 8,500 in June due in part to excitement over the iPhone 3G launch at Apple's Worldwide Developers Conference. Not all of these members are still active, of course, but it shows that the news, rumors, and discussions at MacRumors have continued to attract a larger and larger audience. Recently we celebrated our 8th birthday and over 5 million posts. Thanks to our readers, forum participants, and MacRumors staff for making MacRumors the #1 Apple-centric website on the internet. Want to join the fun? Register to participate in the forums!